Tabor Academy in Marion, Massachusetts, offers a one-semester "Practical Ship and Boat Design" course that "aims to get students comfortable with lines drawings by lofting a sailing model full scale," writes instructor David Bill. "The final design project of the course is to create a lines drawing of 'My Dreamboat.'" Each student also builds a radio-controlled Tippecanoe T27 model from kits that have pre-cut pieces. "Constructing the model requires each student to develop a sense of how boats are constructed and to develop some craftsmanship skills," says David. It took each class about 30 class periods over six weeks to complete the models. 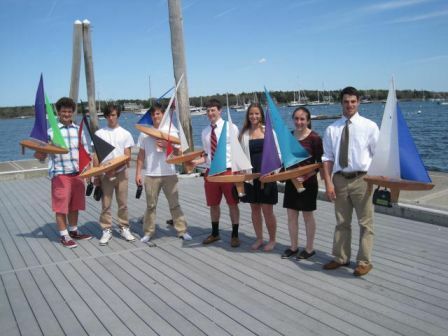 Launching day was the highlight for the students as they sailed and raced their models.